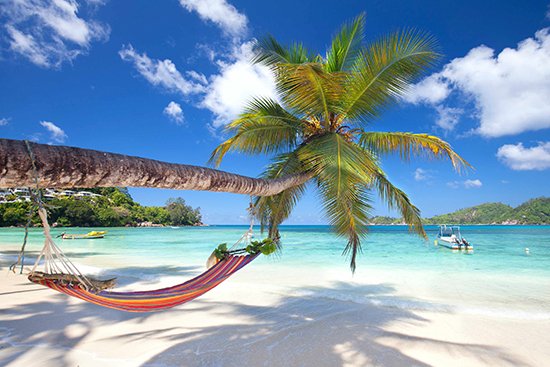 Rising from the warm blue waters of the Indian Ocean, almost 1,000 miles east of Africa, the Seychelles is a collection of 115 unspoiled jungle-clad islets, some little more than a lonely rock or two, fringed by soft white sand beaches and gently swaying palm trees. The vast majority of the islands are uninhabited and with just over 5,000 hotel beds in the whole country, the archipelago retains an air of exclusivity, with blissfully empty beaches and deserted coastal spots easy to come by. Flying into Seychelles International Airport, the aerial view of Mahé’s mountainous cloud forest fringed by white powdery beaches is most visitors’ first impression of the archipelago. 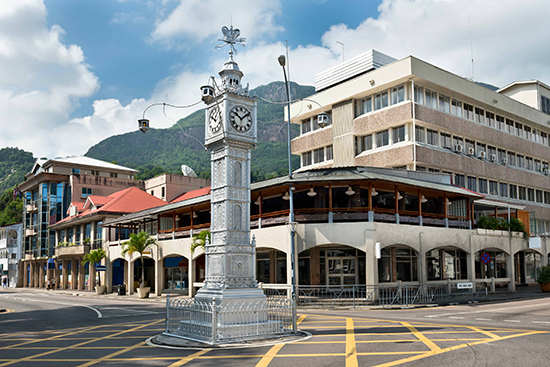 The largest of the islands and site of the nation’s quaint capital Victoria, Mahé is home to 86% of the Seychellois population. It’s best to explore its hidden coves by car, but be sure to spend at least a couple of hours wandering around Victoria’s Botanical Gardens and art galleries, and viewing its famous clocktower, a replica of one near London’s Victoria Station. A 45-minute ferry ride from Mahé, laid-back Praslin is the second largest of the islands. 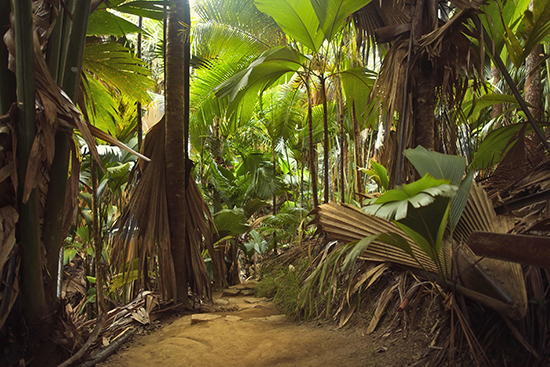 Most visitors make a beeline for the luxury hotels, restaurants and boutiques of the Côte d’Or, but the real highlight is the magnificent Vallée de Mai, a UNESCO World Heritage site filled with towering indigenous trees and one of only two places in the world where you can spot naturally occurring coco de mer palms. 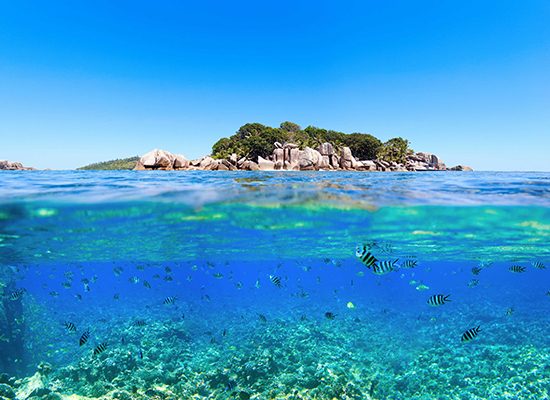 Praslin’s sun-kissed beaches offer plenty of snorkelling and diving opportunities too, and are only a short hop to the hawksbill turtles of Curieuse Marine National Park or the birdwatching haven of Cousin Island, just over a mile away. Slow the pace down on lush Denis Island, carpeted in coconut palms and casuarina trees and blessed with a ring of snow-white sand. A number of conservation projects protect the spectacular marine life found just offshore, and you can see it for yourself on a diving or snorkelling trip arranged by Denis Island Lodge, the only place to stay on the island. Look out for clownfish, rays, turtles and reef sharks among the corals, and keep your eyes peeled for dolphins frolicking in the surf. 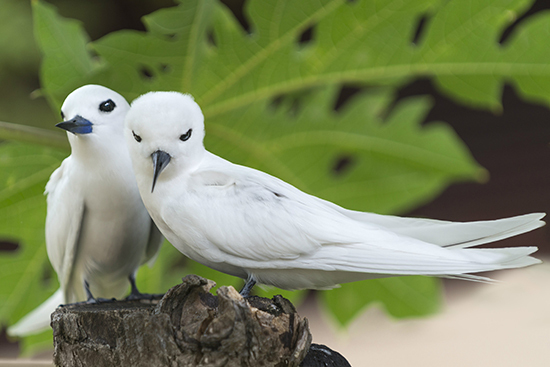 The Seychelles’ northernmost point, Bird Island is unsurprisingly home to a lot of birds. Its tiny 0.3 square miles are chock-full of avifauna with 700,000 pairs of sooty terns coming here to nest between March and October. Although the beaches here are lovely, most visitors come for the wildlife, which also includes rabbits, fairy terns, lesser noddies, octopus and hawksbill turtles. 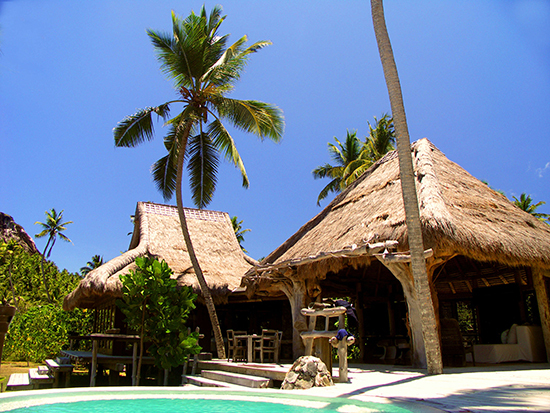 There’s just one place to stay: the lovely (and eco-friendly) Bird Island Lodge. So laid-back it’s practically horizontal, La Digue is home to a 2,000-strong Creole community, who still use traditional oxcarts as transport and are particularly welcoming to visitors curious about their way of life. Until recently, no cars were allowed on this time-warp isle, and even today the best way to explore is by bicycle. Spot the elusive black paradise flycatcher in Veuve Nature Reserve or try beachcombing among the soft sands and pink granite boulders of Anse Source d’Argent, arguably the Seychelles’ prettiest beach. Wildlife-rich Frégate lies 35 miles from Mahé and is home to one luxury private resort, the Frégate Island Villas. Here, around 2,000 Aldabra giant tortoises roam free among the banyan trees and green turtles nest on talcum powder beaches, including the sweeping sands of Anse Victorin, once voted the ‘World’s Best Beach’ by The Times. Other species to look out for include the rare Seychelles magpie-robin, fruit bats and the Frégate giant tenebrionid beetle, found nowhere else in the world. One of just two of the Outer Islands with accommodation, Desroches lies 120 miles southwest of Mahé, surrounded by colourful reefs and over eight miles of postcard-perfect beaches. 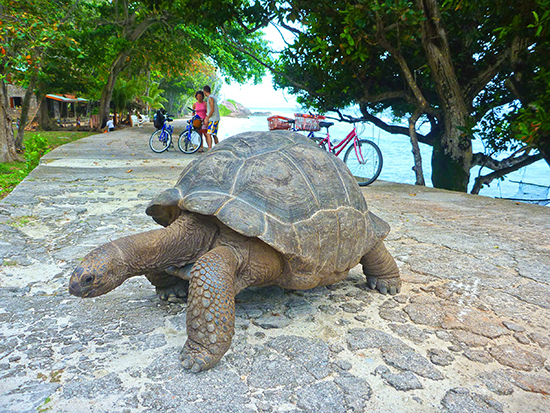 Desroches is only four miles long and a mile wide, making it a great place to pack a picnic and explore by bike. Water sports enthusiasts will be in their element at the colonial style Desroches Island Resort, which arranges diving, deep sea fishing, fly fishing, windsurfing, kayaking and pedalo hire. The ultimate in barefoot luxury, this uninhabited island is home to the exclusive North Island Lodge, the rumoured honeymoon location for the Duke and Duchess of Cambridge. With exquisite villas and a unique dining concept whereby guests dictate their own menu, this is one of the world’s most lavish hideaways. Activities include diving, biking and kayaking, or perhaps a day trip to nearby Silhouette Island, whose forests are dotted with orchids and pitcher plants. But most come here to relax, sit back and do nothing at all.